Divided Europe spreads contagion fears in U.S. The European debt crisis drew new cries of alarm on Monday as a top White House adviser warned it could slow a global economic recovery, a European Union official sharply critiqued Germany, and investors worried a Spanish bank bailout could signal further distress. Financial markets were already factoring in European risk for the U.S. recovery when White House economic adviser Lawrence Summers said "recent events in Europe have introduced uncertainty into the prospects of global growth." Summers listed Europe's debt problems as one several potential troubles facing the U.S. economy in a speech at the Johns Hopkins School of Advanced International Studies. The euro swooned, U.S. stocks fell and gold climbed 1 percent as some investors worried that Europe's troubles could trigger a double-dip U.S. recession. Investors' nagging doubts over whether Europe has a unified commitment to address its debt problems were underscored by comments from the president of the European Commission, Jose Manuel Barroso, who called Germany's aim to modify provisions of the European Union treaty governing member states' budgets "naive," saying it could prompt other members to propose additional changes. "We will not propose treaty modifications even though we are open to good ideas," Barroso told the German newspaper Frankfurter Allgemeine Zeitung. "It would also be naive to think one can reform the treaty only in areas Germany considers important," he said in comments that highlighted the difficulties Europe faces in enacting reforms while its leaders remain divided. Europe's problems grew over the weekend when the Bank of Spain took over the running of a small savings bank, CajaSur, after its planned merger with another small Spanish lender failed. It was the first of what could be several rescues before mid-year and contributed to weakness in the euro ,which fell more than 1 percent against the U.S. dollar. The Spanish bailout was "a sign that sovereign debt risk is spreading from the public to the private sector," said Dan Cook, a senior market analyst at IG Markets Inc in Chicago. "This move further highlights the risk to, and weakness in, the European banking sector." 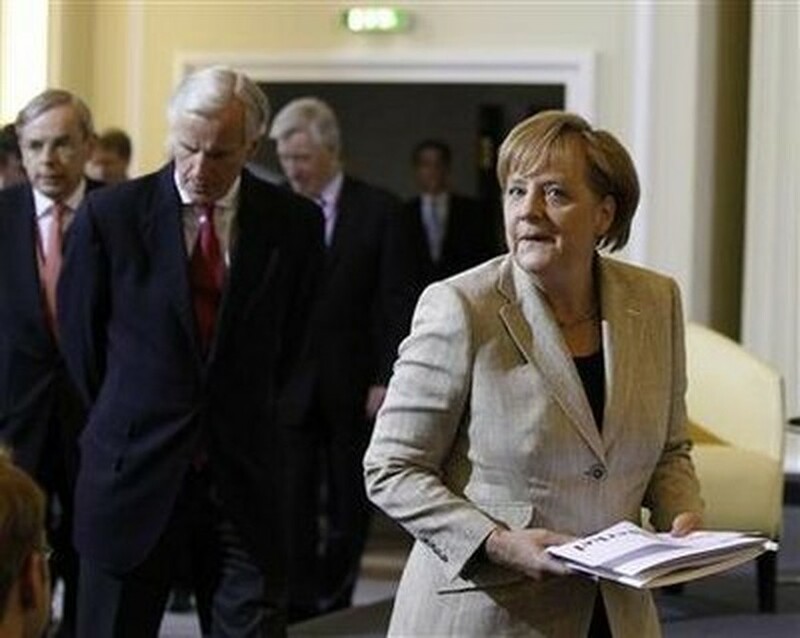 German Chancellor Angela Merkel had been reluctant to come to the aid of indebted European states such as Greece, Spain, Ireland and Portugal that have undermined confidence in the euro zone economy. The euro zone is the No. 1 buyer of U.S. exports. But Merkel relented earlier this month, leading the European Union to announce a $1 trillion safety net for euro zone states and a 110 billion euro aid package for Greece. The measures have yet to restore confidence in Greece, where austerity measures have led to violent street protests. After months of pressure from investors and EU partners, the Spanish government last week finally announced sweeping austerity measures that would cut civil service pay 5 percent this year, freeze wages in 2011, and trim 13,000 public sector jobs in a country that already has 20 percent unemployment. That in turn led the country's largest labor union to threaten a general strike, pitting the Socialist government against its traditional base of support. U.S. stocks ended lower, with the Dow industrials down 1.2 percent to post their lowest close since February 10. The broader S&P 500 lost 1.3 percent and the tech-heavy Nasdaq lost 0.7 percent. "Europe remains the dominant issue, and people suspect that the issues there will translate into slower growth in the United States," said Gary Shilling, president of investment research firm A. Gary Shilling & Co in Springfield, New Jersey. Gold prices rose more than 1 percent as investors moved into a traditional retreat during uncertain times. "People are going into safety. Things are not going to change overnight," said George Goncalves, head of U.S. interest rate strategy with Nomura Securities International in New York.